Acknowledging that more and more people are shopping online these days, Mayor Muriel Bowser reminded D.C. residents that it's a good idea to also shop at neighborhood stores. See photos. WASHINGTON — Sandwiched between Black Friday and Cyber Monday is Small Business Saturday. The day, set aside to promote small businesses, found D.C. Mayor Muriel Bowser visiting small shops across the city. Among the mayor’s stops was Baked by Yael, a colorful Connecticut Avenue bakery across the street from the National Zoo. 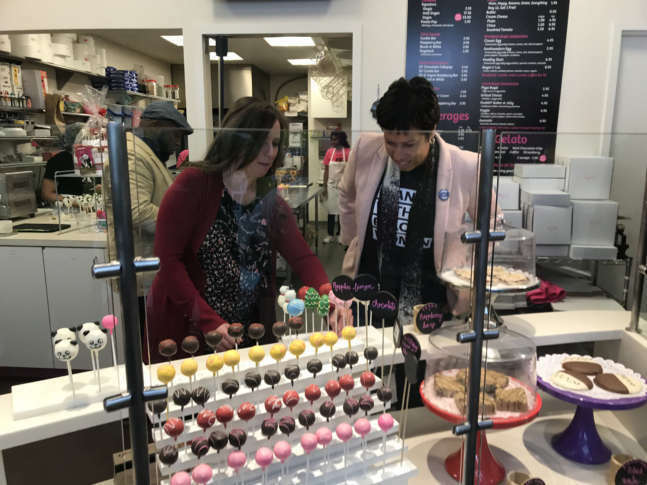 “We want to remind people all up and down Connecticut Avenue that she sells great bagels and cake pops,” Mayor Bowser said after trying her hand at rolling bagels and dipping cake pops in chocolate covering. “We make everything from scratch, all of our cake pops, bagels, black and white cookies and everything else,” said owner Yael Krigman, a lawyer who left a big D.C. law firm to start her bakery business several years ago. “We’ve grown from one employee to almost three dozen employees. The vast majority are D.C. residents,” she said. Acknowledging that more and more people are shopping online these days, Mayor Bowser reminded residents that it’s a good idea to also shop at neighborhood stores. “They’re filling the space, they’re hiring D.C. residents and helping build revenue in D.C. that pays for all other services,” Bowser said. Ward 3 D.C. Councilmember Mary Cheh says the city hopes, in the months ahead, to freshen up some of it’s commercial blocks, particularly in Cleveland Park, to keep them looking welcoming and inviting. “We’re going to do streetscapes and improvements along the storefronts … put out some street furniture, awnings, things that make it look good,” Cheh said. Small business owners must hustle to keep up with the competitive environment. Baked by Yael offers online sales in addition to its colorful storefront. “We also do curbside pickup so people can drive by and we’ll run their order out to them,” Krigman said. For Krigman it’s been a big change to go from practicing attorney to small business owner. “It’s so enjoyable, challenging and rewarding in so many different ways. The look that you see on people’s faces when they come in and they see our bagels and our cake pops … makes it all worth it,” she said.